This page allows you to set a transparent MASK to isolate the desired ASPECT ratio on the image. This feature is especially useful for the MONITOR output, to isolate the frame for the director. VAR WIDTH dial in the desired width in pixels (NOT percentage). The best method is to align the mask with the frame lines you defined with the BOX CURSOR on page 4. 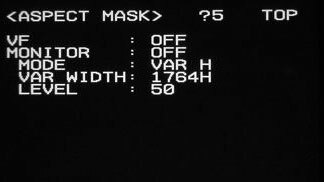 LEVEL : Dial in the desired transparency of the MASK. Best done with an image. The transparency options are: 0 (black border/no transparency), 12.5, 25 and 50%. Note that the when MASK is ON in this page, it can then be toggled ON or OFF by means of a switch on the SONY Viewfinder. 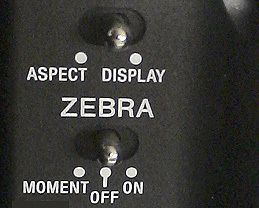 To toggle: repeatedly click top switch rightwards toward DISPLAY.